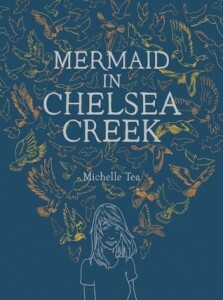 Mermaid in Chelsea Creek introduces a teenage heroine whose problems go well beyond those of romance or friendship: Sophie Swankowski learns that her task is nothing less than to save humans from evil, defined here as the darkness that is inside all of us. Michelle Tea’s first YA novel examines teenage angst, free will and destiny, resulting in a book that should appeal to readers of all ages. Many will be pleased to discover that it is the first of a trilogy. Chelsea, Massachusetts is a miserable, working-class town populated with bullying males, pregnant teenagers and children who like to hyperventilate for amusement and relief. It is driven by its own mythology, the persistent belief that a girl who craves salt will emerge from this community to become its savior. So committed to this myth are the people of Chelsea that some mothers are willing to risk a baby’s life to see if she is the chosen one. Sophie, a scruffy thirteen-year-old from a single-parent household, is this girl. A summer job at the city dump, owned by her mysterious grandmother, leads Sophie to discover treasures she could never have imagined, most importantly, her own family history. But since she is from a line of witches, this history, and her place in it, is complicated and terrifying. She must undergo grueling training before she can begin to understand her own power, the gift of being able to read the hearts of others. Sophie’s destiny unfolds in a state of mounting urgency against a backdrop of witches, spells, talking pigeons, and various supernatural characters. “You don’t abuse your children to see if a fairy tale is true,” Sophie’s mother warns her in the opening pages. Tea is interested in exploring every facet of family life, especially those moments when, strained by poverty and human fallibility, love runs out. 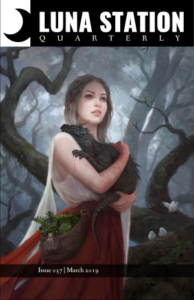 A mother’s ambitions for her daughter–or lack thereof–is the theme powering much of this fantasy novel. In the final analysis, Sophie’s experience proves that the best one can do for a child tasked with the impossible is to believe in her. While some readers might get lost in the book’s terminology (many of the words used to describe the supernatural realm are of Polish origin, and they build quickly), Tea manages to keep Sophie’s experience anchored in the so-called real world. We learn that Sophie is still expected to start high school in the fall, and we watch her relationship with her best friend, Ella, dissolve in a series of painful misunderstandings and scenes of adolescent betrayal well known to the genre. When Sophie joins with the mermaid who has been waiting for her all along, it is still easy to imagine her returning to the streets of her hometown, where another kind of work is never finished.